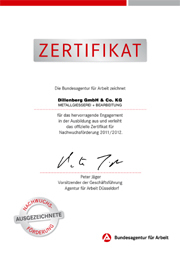 As a vocational trainer accredited by the Düsseldorf Chamber of Commerce, we give young people the chance to learn and thus to enter into professional life. With a constantly high training rate of around 15%, we are fully assuming our social responsibilities and providing young people with promising perspectives. Those demonstrating exceptional skill during the apprenticeship have the opportunity to reduce the length of the trainee program. Furthermore, as a successful candidate, you can expect to receive a lucrative offer of a secure position. But this is not all we offer you. If you are looking to further your skills and continue learning, then our company is just right for you. We look forward to developing perspectives mutually and supporting you in reaching these goals. In November 2012 the official certificate for the excellent engagement in education and apprenticeship was awarded to us by the federal agency for work.